The rose garden of Furukawa Garden (旧古川庭園) is one of the most famous rose garden in Tokyo. At the british style garden, there are 90 kinds 180 rose trees. In the middle of May, those roses bloom beautiful flowers. 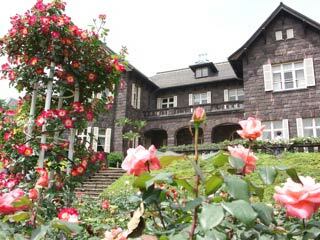 You can enjoy Japanese style garden and wonderful rose at the same time in this season. There is a rose festival from the middle of May to the end of May. There is a light up until 21:00 during the festival (2011 is canceled.). On Saturdays during the festival, there are music events.